Objective: To investigate, using functional MRI (fMRI), the neural network that is activated by the pain component of capsaicin-induced secondary mechanical hyperalgesia. Background: Mechanical hyperalgesia (i.e., pain to innocuous tactile stimuli) is a distressing symptom of neuropathic pain syndromes. Animal experiments suggest that alterations in central pain processing occur that render tactile stimuli capable of activating central pain-signaling neurons. A similar central sensitization can be produced experimentally with capsaicin. Methods: In nine healthy individuals the cerebral activation pattern resulting from cutaneous nonpainful mechanical stimulation at the dominant forearm was imaged using fMRI. Capsaicin was injected adjacent to the stimulation site to induce secondary mechanical hyperalgesia. The identical mechanical stimulation was then perceived as painful without changing the stimulus intensity and location. Both activation patterns were compared to isolate the specific pain-related component of mechanical hyperalgesia from the tactile component. Results: The pattern during nonpainful mechanical stimulation included contralateral primary sensory cortex (SI) and bilateral secondary sensory cortex (SII) activity. During hyperalgesia, significantly higher activation was found in the contralateral prefrontal cortex: the middle (Brodmann areas [BAs] 6, 8, and 9) and inferior frontal gyrus (BAs 44 and 45). No change was present within SI, SII, and the anterior cingulate cortex. Conclusions: Prefrontal activation is interpreted as a consequence of attention, cognitive evaluation, and planning of motor behavior in response to pain. The lack of activation of the anterior cingulate contrasts with physiologic pain after C-nociceptor stimulation. It might indicate differences in the processing of hyperalgesia and C-nociceptor pain or it might be due to habituation of affective sensations during hyperalgesia compared with acute capsaicin pain. Figure 1. Schematic drawing of experimental setup. Mechanical stimulation with a von Frey filament was performed within the marked square in normal skin (A; precapsaicin) and within the area of secondary mechanical hyperalgesia (B; postcapsaicin). An identical mechanical stimulus was transformed from a nonpainful to a painful stimulus. Application of capsaicin at the forearm (black spot) induced burning pain and surrounding dynamic and punctate mechanical hyperalgesia accompanied by an axon reflex vasodilatation (flare). Most previous functional imaging studies analyzed the response to acute, painful stimuli that activate high-threshold C-nociceptors (e.g., noxious heat, injection of irritant chemicals, or painful electric shocks). Multiple neural networks that subserve different functional dimensions of acute pain processing have been consistently described. These functional dimensions include sensory–discriminative, cognitive–evaluative, affective–motivational, and motor–integratory components. However, by using intense acute nociceptive stimuli, mechanisms of physiologic pain processing are analyzed rather than mechanisms of abnormal pain sensations like hyperalgesia. Therefore, capsaicin-induced secondary hyperalgesia provides an opportunity to examine the cerebral correlates of this abnormal pain processing. We have investigated the neural network that is activated during mechanical hyperalgesia in healthy humans. First, the cerebral activation pattern resulting from a nonpainful cutaneous mechanical stimulus was imaged. Second, the pattern induced by the identical mechanical stimulus applied to the same skin site, now within the capsaicin-evoked secondary hyperalgesia and therefore perceived as painful, was analyzed. By comparing both patterns it was possible to isolate the specific pain-related component of mechanical hyperalgesia from the tactile component that is needed to elicit hyperalgesia. All studies were performed with the approval of the institutional human studies committee. Nine healthy volunteers (four men, five women; all right-handed; mean age, 38.0 ± 3.2 [SEM] years) provided informed consent before participating in the study. The individuals did not have acute or chronic pain and did not receive any pain medication or drugs that modulate pain perception 24 hours before the study. All individuals received a test injection of capsaicin on the contralateral forearm 2 days before the functional MRI (fMRI) experiment. The fMRI study session lasted approximately 1.5 hours. Nonpainful mechanical stimulation of the skin and induction of capsaicin-evoked secondary mechanical hyperalgesia. Tactile stimuli were presented using von Frey nylon monofilaments. A square-shaped area of skin (1 cm2) on the right lower forearm was marked with a pen (see figure 1). The skin within this area was stimulated repetitively (3 Hz) using a filament with a diameter of 0.58 mm, which exerted a force of 34.7 g. First, three consecutive imaging series were performed during nonpainful stimulation of the normal skin within the marked square (before capsaicin). Then, 20 μL of a solution containing 0.5% capsaicin (100 μg) was injected intracutaneously with a 0.3-mL syringe 1 cm away from the marked stimulation site.8 This injection evoked an intense, burning pain at the application site that waned after several minutes. In addition, an area of secondary hyperalgesia developed that spread across the marked square in all individuals (see figure 1). 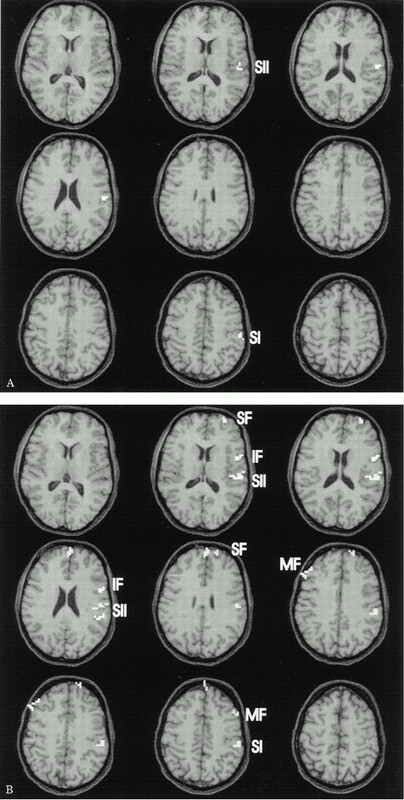 After the capsaicin injection, two to four consecutive imaging series were performed during identical von Frey stimulation within the marked square. Using this stimulation paradigm, mostly punctate hyperalgesia (activation of Aδ-mechanoreceptors) is elicited. To a smaller extent the dynamic component of secondary hyperalgesia is also induced (activation of Aβ-mechanoreceptors due to the vibratory component). After each series, the individuals had to rate the intensity of the secondary hyperalgesia that was elicited during the scan on a numeric rating scale (NRS) of 0 to 10. In this protocol, the purely tactile stimulation was always first, and the hyperalgesic state second, inherent to the capsaicin model. This fixed temporal sequence might influence theoretically the activation pattern. Assessment of capsaicin-evoked secondary mechanical hyperalgesia. After fMRI was performed, the borders of the areas of secondary mechanical hyperalgesia were assessed by stroking the skin with a cotton swab (dynamic mechanical hyperalgesia) and by tapping with the von Frey filament (punctate mechanical hyperalgesia). Stimulations were done along four linear paths arranged radially around the capsaicin-sensitized skin in steps of 5 mm at intervals of 1 second. The areas of the different hyperalgesic zones were marked on the skin with a pen in different colors and afterward drawn on plastic film for measurement with a digital planimeter. Imaging was performed using a standard clinical GE 1.5-T Signa scanner and a whole head coil (GE Medical Systems, Milwaukee, WI). An anatomic high-resolution three-dimensional steady-precession gradient-recalled series (axial; interleaved; matrix, 256 × 256; field of view [FOV], 40 × 40; 124 slices; slice thickness, 1.5 or 3 mm; repetition time [TR], 35 msec; echo time [TE], 6 msec; flip angle, 30 deg; number of excitations, 1; fat saturation) was collected for use in overlay. Functional imaging was performed implementing an ultrafast gradient-recalled echoplanar imaging (GRE-EPI) sequence designed to detect variations in local T2* (axial; matrix, 128 × 128; FOV, 40 × 40; 8 slices; slice thickness, 5 or 6 mm; gap, 1 mm; TR, 2 sec; TE, 69 msec; flip angle, 60 deg; number of excitations, 1; 60 time points; imaging time, 2 minutes). The slices were positioned on a coronal image to encompass the arm area of the pre- and postcentral gyri on the upper and the inferior frontal gyrus on the lower border. The resulting voxel (three-dimensional pixel) size was 3.1 × 3.1 × 5 mm (48.1 mm3) or 3.1 × 3.1 × 6 mm (57.7 mm3). Each functional imaging sequence consisted of a block design with six alternating 20-second intervals of stimulation and rest. During scanning, each individual’s head was held in position with a plastic vacuum pillow (Olympic Vac-Pac, Olympic Medical, Seattle WA) filled with Styrofoam packing beads, which was fitted around the head. Individuals were instructed to remain still and to keep their eyes closed during each scan. All data were analyzed as described by Bandettini et al.10 Correlation analysis and display were performed using Stimulate (version 5; Dr. J. Strupp, Center for Magnetic Resonance Research, Dept. of Radiology, University of Minnesota, Minneapolis).11 Cross-correlational analysis (stimulus state reference function) was used to determine significantly active voxels. Because the number of active voxels was highly variable between the individuals (Disbrow and Roberts, unpublished observation), it was necessary to determine an optimal individual correlation threshold. Correlation thresholds of 0.3, 0.35, or 0.4 were used with a cluster threshold of five voxels. The individual correlation threshold was the same in the pre- and postcapsaicin series. Eight regions of interest (ROIs) were selected based on the results of previous studies (as reviewed by Kenshalo and Douglass12). These areas included the primary sensory cortex (SI, postcentral gyrus), the secondary sensory cortex (SII), the superior frontal gyrus, the medial frontal gyrus, the inferior frontal gyrus, the parietal association cortex, the inferior parietal lobule, and the anterior cingulate cortex. These regions were defined in each individual based on the cerebral anatomy.13 The location of all ROIs was confirmed by a radiologist (Y.B.). Brain areas located more caudally (i.e., in the brainstem) were not covered by the data acquisition volume (8 slices; slice thickness, 5 to 6 mm depending on head size) and therefore were not included in the analyses. All significantly active voxels within the different ROIs were counted on the original functional EPI images. After anatomic overlay, the exact location and BAs14 were determined using stereotaxic coordinates.15 In addition, for the active voxels in each ROI, the average signal intensity change between stimulus and rest (ASC) was calculated. To estimate the activation intensity of each ROI, the product of the number of active voxels and the ASC value were calculated and given in arbitrary intensity values (amount of activation). We checked regularly for out-of-phase activation, but found none. Two series were discarded because of motion artifacts. For each ROI the mean number of voxels as well as the mean amount of activation of the precapsaicin series were compared with the means of the postcapsaicin series using the paired t-test. For correlation of cerebral activation and area of punctate and dynamic mechanical hyperalgesia as well as pain intensity of hyperalgesia, Pearson’s correlation coefficient was used; p < 0.05 was regarded as significant. Area and pain intensity of secondary mechanical hyperalgesia. During the scans that were performed before the capsaicin injection, no individual felt any pain in response to von Frey stimulation within the marked site at the right lower forearm. After capsaicin injection, all individuals developed an area of secondary punctate hyperalgesia that involved the marked stimulus site. The area of punctate hyperalgesia varied from 28.7 to 110.5 cm2 (55.9 ± 8.6 cm2, mean ± SEM). The pain intensity of the secondary hyperalgesia induced during the postcapsaicin scans varied from NRS 1.8 to 6.8 (3.8 ± 0.6). All but one individual also developed dynamic secondary hyperalgesia (area, 24.9 to 51.5 cm2, 33.8 ± 3.8 cm2). In all patients, the area of punctate hyperalgesia was larger than the area of dynamic hyperalgesia. Voxel counts and amount of activation. The amount of activation (number of active voxels multiplied by the ASC) was calculated for each ROI for quantitative analysis. The values for the ASC varied in different ROIs from 0.24 to 4.81% (mean, 2.5%), which is comparable with other studies.16 The amount of activation varied from 0 to 63.1 in the ROIs. In addition to the amount of activation, all ROIs were also compared using the number of activated voxels alone. In general, the same results were obtained using both measures. However, the mean differences were larger for the amount of activation. Therefore, the data presented are given as amount of activation. Cerebral activation during nonpainful mechanical stimulation. Nonpainful mechanical von Frey stimulation of the right lower forearm resulted in prominent and consistent activation of the contralateral left-hemispheric SI (eight of nine individuals; figures 2 and 3⇓) as well as the contralateral left (eight of nine individuals) and the ipsilateral right SII cortices (seven of nine individuals). Activation of SI was located on the postcentral gyrus in a region consistent with the representation of the lower forearm and hand (see figures 2 and 3⇓). All other ROIs showed only small areas of activation in zero to four of the nine individuals (see figure 4). 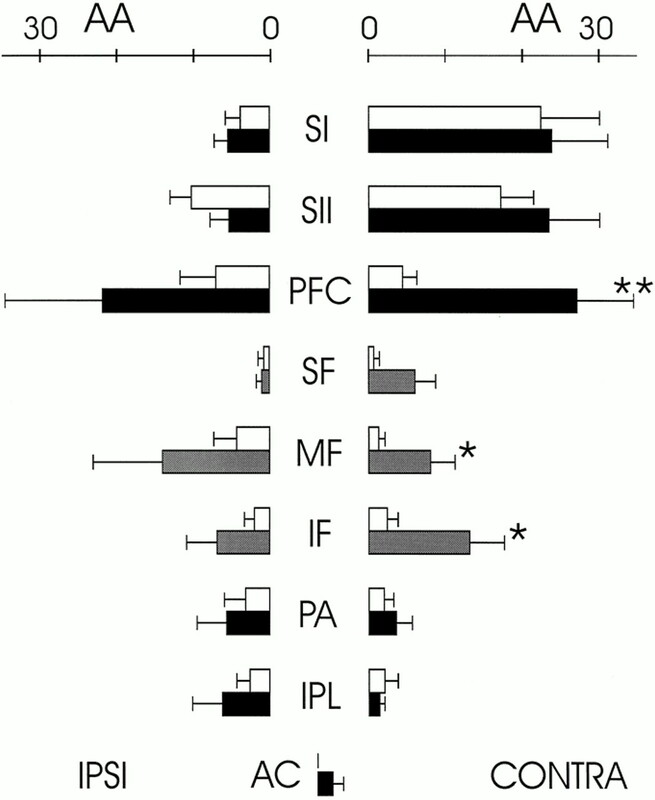 The mean amount of activation in all ROIs and for all individuals is shown in figure 4 (precapsaicin, white bars). The location of all active areas is shown in the table. Figure 2. Activation and signal intensity within the primary sensory cortex (SI). (A) Location of activation within SI during nonpainful mechanical stimulation. The activation is located on the postcentral gyrus in a region consistent with the representation of the lower forearm/hand (stereotaxic coordinates15: −38, −31, +44). (B) Time course of signal intensity. For the active voxels in SI, the signal intensity change between mechanical stimulus and rest is shown in arbitrary units (AU). The relative average signal change in this region of interest was 3.64%. Dark bars represent periods of stimulation (20 sec each). Figure 3. Cerebral activation pattern in response to cutaneous mechanical stimulation in one individual before (A; nonpainful) and after (B; secondary mechanical hyperalgesia) capsaicin injection. SI = primary somatosensory cortex; SII = secondary somatosensory cortex; SF = superior frontal gyrus; MF = middle frontal gyrus; IF = inferior frontal gyrus. Stereotaxic coordinates15: pre-SI contralateral (−56, −25, +31), pre-SII contralateral (−50, −20, +13), post-SI contralateral (−52, −26, +31), post-SII contralateral (−46, −26, +17), post-SF contralateral (BA 10: −29, +60, +22; BA 9: −18, +58, +34), post-MF contralateral (BA 6; −46, +15, +39), post-MF ipsilateral (BA 8: +52, +22, +33), and post-IF contralateral (BAs 44 and 45: −50, +2, +17). Figure 4. Quantitative analysis of the cerebral activation in response to tactile stimulation and mechanical hyperalgesia. Average amount of activation (AA = number of active voxels multiplied by average signal change) within each region of interest in response to cutaneous mechanical stimulation before (nonpainful, white bars) and after (secondary mechanical hyperalgesia, dark bars) capsaicin injection. Mean of all individuals (n = 9) and SEM. *p < 0.05; **p < 0.01. The prefrontal cortex (PFC) is further subdivided into the superior frontal (SF), middle frontal (MF), and inferior frontal (IF) gyrus. SI = primary somatosensory cortex; SII = secondary somatosensory cortex; PA = parietal association cortex; IPL = inferior parietal lobule; AC = anterior cingulate cortex; IPSI = ipsilateral; CONTRA = contralateral. Cerebral activation during capsaicin-induced secondary mechanical hyperalgesia. Prominent and consistent activation was found in the left SI cortex (eight of nine individuals) and in the left (eight of nine individuals) and right SII cortex (six of nine individuals; see figures 3 and 4⇑). In contrast to the activation during nonpainful stimulation, seven individuals showed prominent activation within the left prefrontal cortex (described later; see figures 3 and 4⇑). In all other ROIs only a few voxels were activated in three to five individuals. Interestingly, also in the anterior cingulate cortex (BA 24), only a few voxels were activated in three of nine individuals. The mean values for the amount of activation for all ROIs are shown in figure 4 (postcapsaicin, dark bars). The location of all active areas is shown in the table. Surprisingly, in one of the individuals no significant activation was elicited during capsaicin-evoked hyperalgesia, although prominent activation in the characteristic pattern was present during the nonpainful stimulation. Because no technical reasons or motion artifacts could be identified for this obvious discrepancy, the individual was not excluded from the analysis. Comparison of cerebral activation between nonpainful mechanical stimulation and capsaicin-induced secondary mechanical hyperalgesia. Hyperalgesia is a partial composite of both pain and a tactile sensation. To isolate the specific pain-related activity pattern of mechanical hyperalgesia from that related to the mechanical stimulus that is used to elicit hyperalgesia, the pattern of mechanical stimulation within the hyperalgetic zone was compared statistically with the pattern of the same mechanical stimulation to normal skin. In general, the extent of activation tended to be larger during hyperalgesia in nearly all ROIs (see figures 3 and 4⇑). Two regions showed significantly higher activation values (amount of activation as well as number of voxels) during mechanical hyperalgesia compared with nonnoxious mechanical stimulation (p < 0.05; see figures 3 and 4⇑): the left middle frontal gyrus (mainly within the supplementary motor cortex, BA 6, also including parts of BAs 8 and 9) and the left inferior frontal gyrus (mainly BAs 44 and 45). Combining the data of all three left frontal gyri in the prefrontal cortex, the difference was also significant (p < 0.01; see figure 3). It should be noted that no significant increase of activation could be detected in SI, SII, and the anterior cingulate cortex (BA 24). Correlation of cerebral activity versus area and intensity of secondary hyperalgesia. The difference in the amount of activation between nonpainful mechanical stimulation and capsaicin-induced secondary mechanical hyperalgesia was correlated with the area of punctate and dynamic mechanical hyperalgesia as well as with the pain intensity of the mechanical hyperalgesia (NRS). Activation in the middle frontal gyrus showed a significant correlation with the pain intensity of the induced hyperalgesia (r = 0.73, p < 0.05) as well as with the area of the punctate mechanical hyperalgesia (r = 0.89, p < 0.01). Cerebral activation during nonpainful mechanical stimulation. The response to innocuous cutaneous tactile and vibratory stimuli has been examined previously using PET and fMRI. Activation of the contralateral primary somatosensory cortex (SI) and of the ipsilateral and contralateral secondary somatosensory cortex (SII) has been detected consistently.16-20 Furthermore, activation has been described in ipsilateral SI,16,21 bilaterally in the anterior insular cortex,17 bilaterally in the posterior insular cortex,17,20 in the ipsilateral parietal association cortex (BA 7),17 in the ipsilateral inferior parietal lobule (BAs 39 and 40),17 bilaterally in the middle frontal gyrus (BAs 6 and 8),17,18,20 contralateral in the hippocampal gyrus,17 and in the anterior cingulate cortex (BA 24).17,20 In the current study, a similar cerebral activation pattern was detected with prominent activation within the contralateral SI and bilaterally in SII. No individual showed activation in the anterior cingulate gyrus (BA 24). Cerebral activation during C-nociceptor-mediated physiologic pain. Activation pattern of the pain component of secondary mechanical hyperalgesia. Mechanical secondary hyperalgesia is an abnormal pain sensation that accompanies many neuropathic pain states. In contrast to C-nociceptor-mediated physiologic pain, mechanical hyperalgesia is elicited by activation of mechanoreceptors that normally convey nonnoxious tactile sensations. The tactile sensation is transformed into a painful sensation by abnormal processing in the CNS. Therefore, the cerebral activation pattern in response to mechanical hyperalgesia consists of two components. One is associated with processing of tactile information and the second is associated with the pain sensation itself. In the current study, an identical mechanical stimulus was applied either to normal or to secondary hyperalgesic skin to transform a nonpainful into a painful sensation (see figure 1). By comparing the activation patterns of both conditions it is possible to isolate the specific pain components of mechanical hyperalgesia from those related to the tactile stimulation. This comparison revealed significantly higher activation in the contralateral prefrontal cortex: the middle (BAs 6, 8, and 9) and inferior frontal gyrus (BAs 44 and 45). No difference was present within SI, SII, and the anterior cingulate cortex. However, because the number of active voxels was highly variable between the individuals, subtle changes in activation might have missed statistical significance. Furthermore, changes in the brainstem and thalamus that might be involved in the development of mechanical hyperalgesia were not addressed in the current investigation. Iadarola et al.17 performed a PET study during which they also used the capsaicin pain model to induce secondary hyperalgesia. The fMRI technique is characterized by a better spatial and temporal resolution compared with PET, whereas PET offers the opportunity to image the whole brain. However, blood flow and activation changes in specific ROIs induced by somatosensory stimuli are comparable with both methods. In contrast to the current study, Iadarola et al.17 analyzed the pure dynamic component of secondary hyperalgesia. Dynamic hyperalgesia induced by light brushing of the skin was compared with light brushing of the skin before capsaicin to distinguish the pain component of dynamic hyperalgesia. As in the current study, activation of the prefrontal cortex (inferior and superior frontal gyri) that extended into BAs 9, 10, and 11 was prominent during dynamic hyperalgesia. In addition, only some residual activation could be detected in SI and SII, and none in the anterior cingulate gyrus when dynamic mechanical hyperalgesia was compared with light brush. Consistent with the studies on hyperalgesia, activation within the prefrontal cortex has invariably been described in studies on experimental C-nociceptor-mediated pain and unpleasant itch. Therefore, it seems reasonable to conclude that the signal processing within the prefrontal cortex shares similar mechanisms during hyperalgesia and C-nociceptor pain. The association functions of the various regions of the frontal cortex are complex. In general, the prefrontal responses are interpreted as a consequence of encoding (left) and retrieval (right) of episodic memory,35,36 and cognitive evaluation and planning,37 involving behavioral and attentional organization during pain.38,39 Plans to speak and to move are represented in different regions of the prefrontal cortex.40 Activity in the inferior frontal gyrus (BAs 44 and 45) spatially involving Broca’s area (primary speech area)40 could possibly be ascribed to the intention of verbalization during pain.41 Prominent contralateral activation of the middle and inferior frontal gyrus, which involved the premotor cortex (BA 6) and also BAs 44 and 45, may participate in the motor behavior in response to pain (i.e., the initiation and, particularly important in our study, the suppression of stored motor programs). In the current study, the activity in BA 6 correlates significantly with the pain intensity and the spatial distribution of the hyperalgesia that induced it. In a PET study,42 blood flow increase in BA 6 also correlated with the intensity of noxious heat. This intensity encoding of the painful stimulus36 may be necessary to determine the grade of the resulting motor response. The significant activation of the middle frontal gyrus that comprised parts of BA 8 (frontal oculomotor field) may be attributed to visualization or the attempt at visual orientation of a repetitive painful stimulus. The central region most commonly activated in studies on experimental C-nociceptor-mediated pain is the anterior cingulate cortex (BA 24, as described earlier). Therefore, the lack of anterior cingulate cortex response to the pain component of hyperalgesia found in the current study and in that of Iadarola et al.17 is striking. One reason for this might be that there are fundamental differences in the processing of C-nociceptor-mediated physiologic pain and abnormal pain-like secondary capsaicin-induced hyperalgesia. Processing in the prefrontal cortex, which is active in both pain conditions, involves centers of cognitive evaluation, attention, and movement planning.30,37 Activation of this prefrontal neuronal network might be sufficient to recognize a stimulus as painful and to induce a behavior to terminate the stimulus. The anterior cingulate cortex might be involved in specific aspects of the processing of C-nociceptor-mediated pain. C-nociceptor pain, in contrast to hyperalgesia, always indicates a potentially tissue-damaging or even life-threatening stimulus. It might, therefore, be reasonable to activate additional brain structures to react optimally to and withdraw from the stimulus. In addition, the anterior cingulate is involved in behavioral control, such as the implementation or inhibition of action45,46 supported by the close connections of the cingulate and premotor and motor areas.47 An important behavioral aspect of the studies on experimental pain is the need to restrain movement despite a noxious stimulus. This suppression of movement is likely to result in activation of premotor regions (BAs 6, 44, and 45, as described earlier48). However, the anterior cingulate participates in motor response selection for noxious stimuli.45 In the current study, the individuals did not have any option to move or to react adequately. Therefore, this region might be inactive during hyperalgesia in our experiments. Moreover, the anterior cingulate cortex is involved in learning associated with prediction and avoidance of noxious stimuli.45 In contrast to C-nociceptor pain paradigms, the volunteers in our study have no memory of a pathologic pain sensation (i.e., hyperalgesia). This might also explain the lack of cingulate activation observed in our study. Primary and secondary somatosensory cortices. Contralateral SI and SII showed considerable activation during nonpainful mechanical stimulation as well as during hyperalgesia (figure 4), but there was no significant difference between the activation patterns. This lack of activation due to the pain component of hyperalgesia is somewhat surprising because it was reported in approximately half of the studies on physiologic C-nociceptor-mediated pain. SI is assumed to participate in the discriminatory component of the pain sensation.27 However, in support of our results, only a small amount of somatosensory activation remained when activation from capsaicin-evoked dynamic mechanical hyperalgesia was subtracted from light touch in a previous PET study.17 One factor contributing to the discrepancy might be that with hyperalgesia the difference in signal for painful versus nonpainful stimulation is smaller than for C-nociceptor-mediated pain. It would therefore be difficult to detect, in particular because the pain intensity was lower in the current study than in previous work on C-nociceptor-mediated pain. Furthermore, activation of the somatosensory cortex in response to C-nociceptor-mediated pain is not consistent. The nociceptive specific projections to SI and SII are known to be sparse12,20 and may be interspersed with neurons that respond to nonpainful tactile stimuli.16,49,50 Alternatively, cortical neurons that are involved in the discriminatory aspects of pain perception may receive a convergent input from nociceptive and nonnociceptive pathways. Hyperalgesia in neuropathic pain patients. Whether capsaicin-induced hyperalgesia provides a reasonable model to investigate the activation pattern seen in hyperalgesia associated with clinical pathologic pain states is unclear. Two studies have been performed investigating dynamic mechanical hyperalgesia in patients with brainstem infarction. In a PET study, Peyron et al.51 found activation in SI, the inferior parietal lobule (BAs 39 and 40), the prefrontal cortex (BAs 6 and 10), as well as the contralateral cingulate gyrus (BA 24) after eliciting hyperalgesia. Lorenz et al.52 used magnetic source imaging to examine the response to electrical stimulation that activated Aβ-mechanoreceptive fibers. They found an SI response on the healthy side and both an SI and a dorsal cingulate gyrus response on the hyperalgesic side. The considerable activation in the cingulate gyrus might be related to the fact that in both studies patients with poststroke pain (i.e., pain after damage to the CNS) were analyzed. Furthermore, the chronic neuropathic nature of the hyperalgesia in patients may induce substantial changes in the neural circuits of pain processing over weeks or years, whereas the capsaicin-induced hyperalgesia develops within minutes and is transient. However, the capsaicin hyperalgesia model provides an informative opportunity to understand acute changes in the CNS that might be similar to those in the early phase of neuropathic conditions. In the future, imaging studies in neuropathic patients with hyperalgesia, in the acute as well as chronic stage, are needed to elucidate the differences in the processing of mechanical hyperalgesia. Supported by a seed grant of the Department of Radiology, University of California at San Francisco (no. 557052-52829), by the REAC Hampton Fund (no. 525179-35848), and by the Alexander von Humboldt-Stiftung fund. The authors thank Susanne Honma and Gary Ciciriello for excellent technical assistance. Fields HL, Rowbotham M, Baron R. Postherpetic neuralgia : irritable nociceptors and deafferentation. Neurobiol Dis 1998;5:209–227. Laird JM, Bennett GJ. An electrophysiological study of dorsal horn neurons in the spinal cord of rats with an experimental peripheral neuropathy. J Neurophysiol 1993;69:2072–2085. Palecek J, Dougherty PM, Kim SH, et al. Responses of spinothalamic tract neurons to mechanical and thermal stimuli in an experimental model of peripheral neuropathy in primates. J Neurophysiol 1992;68:1951–1966. Guilbaud G, Benoist JM, Jazat F, Gautron M. Neuronal responsiveness in the ventrobasal thalamic complex of rats with an experimental peripheral mononeuropathy. J Neurophysiol 1990;64:1537–1554. Guilbaud G, Benoist JM, Levante A, Gautron M, Willer JC. Primary somatosensory cortex in rats with pain-related behaviours due to a peripheral mononeuropathy after moderate ligation of one sciatic nerve : neuronal responsivity to somatic stimulation. Exp Brain Res 1992;92:227–245. Koltzenburg M, Lundberg LE, Torebjörk HE. Dynamic and static components of mechanical hyperalgesia in human hairy skin. Pain 1992;51:207–219. Torebjörk HE, Lundberg LE, LaMotte RH. Central changes in processing of mechanoreceptive input in capsaicin-induced secondary hyperalgesia in humans. J Physiol (Lond) 1992;448:765–780. LaMotte RH, Lundberg LE, Torebjörk HE. Pain, hyperalgesia and activity in nociceptive C units in humans after intradermal injection of capsaicin. J Physiol (Lond) 1992;448:749–764. Magerl W, Wilk SH, Treede R-D. 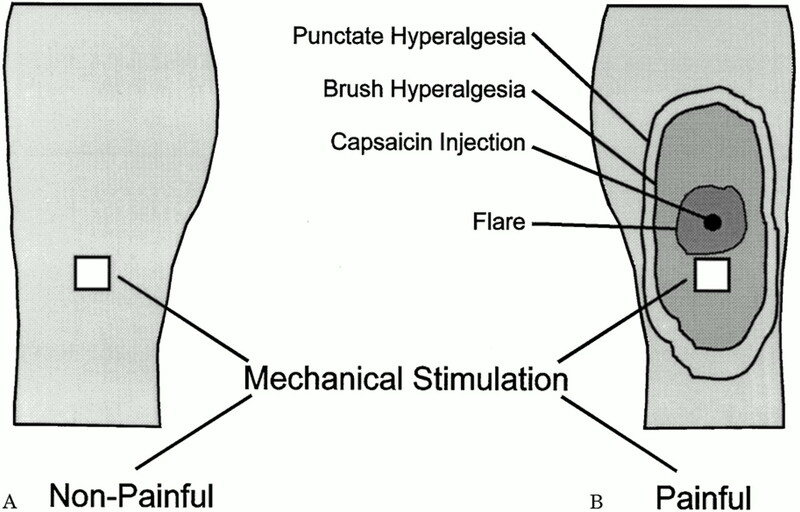 Secondary hyperalgesia and perceptual wind-up following intradermal injection of capsaicin. Pain 1998;74:257–268. Bandettini PA, Jesmanowicz A, Wong EC, Hyde JS. Processing strategies for time-course data sets in functional MRI of the human brain. Magn Reson Med 1993;30:161–173. Strupp JP. Stimulate : a GUI based fMRI analysis software package. Neuroimage 1996;3:S607. Abstract. Kenshalo DR, Douglass DK. The role of the cerebral cortex in the experience of pain. In: Bromm B, Desmedt JE, eds. Pain and the brain: from nociception to cognition. Advances in pain research and therapy. New York:Raven Press, 1995:21–34. Steed M, Bigler ED. MRI brain atlas III. Human brain function: assessment and rehabilitation. New York:Plenum Press, 1995. Brodmann K. Vergleichende Lokalisationslehre der Groβhirnrinde. Leipzig:Barth, 1909. Talairach J, Tournoux P. Co-planar stereotaxic atlas of the human brain. Stuttgart:Thieme, 1988. Disbrow E, Buonocore M, Antognini J, Carstens E, Rowley HA. Somatosensory cortex : a comparison of the response to noxious thermal, mechanical, and electrical stimuli using functional magnetic resonance imaging. Hum Brain Mapp 1998;6:150–159. Iadarola MJ, Berman KF, Zeffiro TA, et al. Neural activation during acute capsaicin-evoked pain and allodynia assessed with PET. Brain 1998;121:931–947. Lin W, Kuppusamy K, Haacke EM, Burton H. Functional MRI in human somatosensory cortex activated by touching textured surfaces. J Magn Reson Imaging 1996;6:565–572. Roberts TP, Rowley HA. Mapping of the sensorimotor cortex : functional MR and magnetic source imaging. AJNR Am J Neuroradiol 1997;18:871–880. Coghill RC, Talbot JD, Evans AC, et al. Distributed processing of pain and vibration by the human brain. J Neurosci 1994;14:4095–4108. Li A, Yetkin FZ, Cox R, Haughton VM. Ipsilateral hemisphere activation during motor and sensory tasks. AJNR Am J Neuroradiol 1996;17:651–655. Casey KL, Minoshima S, Berger KL, Koeppe RA, Morrow TJ, Frey KA. Positron emission tomographic analysis of cerebral structures activated specifically by repetitive noxious heat stimuli. J Neurophysiol 1994;71:802–807. Andersson JL, Lilja A, Hartvig P, et al. Somatotopic organization along the central sulcus, for pain localization in humans, as revealed by positron emission tomography. Exp Brain Res 1997;117:192–199. Derbyshire SW, Jones AK. Cerebral responses to a continual tonic pain stimulus measured using positron emission tomography. Pain 1998;76:127–135. Derbyshire SW, Jones AK, Gyulai F, Clark S, Townsend D, Firestone LL. Pain processing during three levels of noxious stimulation produces differential patterns of central activity. Pain 1997;73:431–445. Casey KL, Minoshima S, Morrow TJ, Koeppe RA. Comparison of human cerebral activation pattern during cutaneous warmth, heat pain, and deep cold pain. J Neurophysiol 1996;76:571–581. Rainville P, Duncan GH, Price DD, Carrier B, Bushnell MC. Pain affect encoded in human anterior cingulate but not somatosensory cortex. Science 1997;277:968–971. Talbot JD, Marrett S, Evans AC, Meyer E, Bushnell MC, Duncan GH. Multiple representations of pain in human cerebral cortex. Science 1991;251:1355–1358. Davis KD, Wood ML, Crawley AP, Mikulis DJ. fMRI of human somatosensory and cingulate cortex during painful electrical nerve stimulation. Neuroreport 1995;7:321–325. Hsieh JC, Stahle–Backdahl M, Hagermark O, Stone–Elander S, Rosenquist G, Ingvar M. Traumatic nociceptive pain activates the hypothalamus and the periaqueductal gray : a positron emission tomography study. Pain 1996;64:303–314. Jones AKP, Derbyshire SWG. PET imaging of pain-related somatosensory cortical activity. In: Bromm B, Desmedt JE, eds. Pain and the brain: from nociception to cognition. Advances in pain research and therapy. New York:Raven Press, 1995:213–227. Hsieh J-C, Hägermark Ö, Stahle–Bäckdahl M, et al. 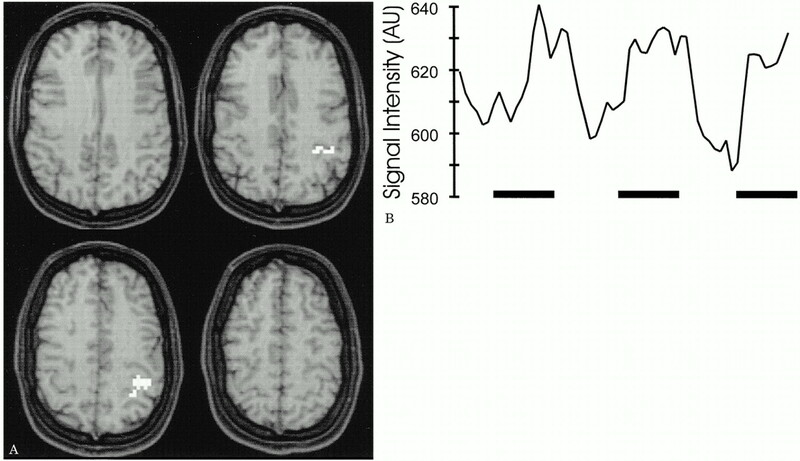 The urge to scratch represented in human cerebral cortex. J Neurophysiol 1994;72:3004–3008. Gyulai FE, Firestone LL, Mintun MA, Winter PM. In vivo imaging of nitrous oxide-induced changes in cerebral activation during noxious heat stimuli. Anesthesiology 1997;86:538–548. Xu X, Fukuyama H, Yazawa S, et al. Functional localization of pain perception in the human brain studied by PET. Neuroreport 1997;8:555–559. Fletcher PC, Shallice T, Frith CD, Frackowiak RS, Dolan RJ. The functional roles of prefrontal cortex in episodic memory. II. Retrieval. Brain 1998;121:1249–1256. Fletcher PC, Shallice T, Dolan RJ. The functional roles of prefrontal cortex in episodic memory. I. Encoding. Brain 1998;121:1239–1248. Honda M, Hanakawa T, Okada T, et al. Lateral and medial area 6 plays a role in cognitive operations nonspecific to motor control in humans. Soc Neurosci Abstr 1998;24:1262. Abstract. Derbyshire SW, Jones AK, Devani P, et al. Cerebral responses to pain in patients with atypical facial pain measured by positron emission tomography. J Neurol Neurosurg Psychiatry 1994;57:1166–1172. Hsieh JC, Hannerz J, Ingvar M. Right-lateralised central processing for pain of nitroglycerin-induced cluster headache. Pain 1996;67:59–68. Friedman L, Kenny JT, Wise AL, et al. Brain activation during silent word generation evaluated with functional MRI. Brain Lang 1998;64:231–256. Ingvar M, Eriksson L, Greitz T, et al. Methodological aspects of brain activation studies : cerebral blood flow determined with [15O]butanol and positron emission tomography. J Cereb Blood Flow Metab 1994;14:628–638. Minoshima S, Paulson P, Rosenberg B, Morrow TJ, Turner RS, Casey KL. Human forebrain rCBF correlates of perceived heat intensity, pain threshold, and tolerance. Cogn Neurosci Abstr 1998;24:1129. Abstract. Posner MI, Dehaene S. Attentional networks. Trends Neurosci 1994;17:75–79. Kupfermann I. Hypothalamus and limbic system: peptidergic neurons, homeostasis, and emotional behavior. In: Kandell ER, Schwartz JH, Jessell TM, eds. Principles of neural science. 3rd ed. London:Elsevier, 1993:735–749. Devinsky O, Morrell MJ, Vogt BA. Contributions of anterior cingulate cortex to behaviour. Brain 1995;118:279–306. Derbyshire SW, Vogt BA, Jones AK. Pain and Stroop interference tasks activate separate processing modules in anterior cingulate cortex. Exp Brain Res 1998;118:52–60. Schlaug G, Knorr U, Seitz R. Inter-subject variability of cerebral activations in acquiring a motor skill : a study with positron emission tomography. Exp Brain Res 1994;98:523–534. Frith CD, Friston K, Liddle PF, Frackowiak RS. Willed action and the prefrontal cortex in man : a study with PET. Proc R Soc Lond B Biol Sci 1991;244:241–246. Chudler EH, Anton F, Dubner R, Kenshalo DR Jr. Responses of nociceptive SI neurons in monkeys and pain sensation in humans elicited by noxious thermal stimulation : effect of interstimulus interval. J Neurophysiol 1990;63:559–569. Kenshalo DR Jr, Chudler EH, Anton F, Dubner R. SI nociceptive neurons participate in the encoding process by which monkeys perceive the intensity of noxious thermal stimulation. Brain Res 1988;454:378–382. Peyron R, Garcia–Larrea L, Gregoire MC, et al. Allodynia after lateral–medullary (Wallenberg) infarct. A PET study. Brain 1998;121:345–356. Lorenz J, Kohlhoff H, Hansen HC, Kunze K, Bromm B. Abeta-fiber mediated activation of cingulate cortex as correlate of central poststroke pain. Neuroreport 1998;9:659–663.